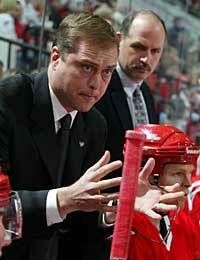 Paul Maurice and Randy Ladouceur, right, were relieved of their duties by the Carolina Hurricanes on Monday. RALEIGH, N.C. – Jim Rutherford, President and General Manager of the Carolina Hurricanes, today announced that Peter Laviolette (Lah-vee-oh-leht) has been named as the franchise’s 11th head coach. Laviolette replaces Paul Maurice, the team’s coach for the past nine seasons, and the team’s only head coach since relocating to North Carolina in 1997. Hurricanes assistant coach Kevin McCarthy, and recently-retired Carolina forward Jeff Daniels will join Laviolette behind the bench. Assistant Coach Randy Ladouceur and Goaltending Consultant Don Edwards have been relieved of their duties. Laviolette most recently coached the New York Islanders and posted a 77-68-19 (6 overtime losses) regular-season record in 164 games during the 2001-02 and 2002-03 seasons, good for a .527 winning percentage. The Islanders qualified for the postseason both years after missing the playoffs each of the seven prior seasons. Prior to joining the Islanders, Laviolette served as an assistant coach with the Boston Bruins after coaching the Providence Bruins, Boston’s American Hockey League affiliate, in 1998-99 and 1999-00. Providence posted a 56-15-4 regular-season record in 1998-99 and went 15-4 in the playoffs to capture the Calder Cup as the AHL’s top team, and Laviolette was named AHL Coach of the Year. A former defenseman, Laviolette was born on July 12, 1964, in Franklin, Mass. He spent most of his 11-year professional playing career in the AHL and IHL, but did play 12 NHL games with the New York Rangers during the 1988-89 season. He also represented the United States in the 1988 and 1994 Olympics, serving as captain of the 1994 Olympic squad. Maurice posted a 268-307-99 (16 overtime losses) (.471) regular-season record in nine seasons with the Hurricanes franchise. He leaves as the franchise’s all-time leader in games coached (674), regular-season wins (268), playoff wins (17) and playoff games coached (35). Carolina captured Southeast Division titles in 1999 and 2002, and the 2002 Eastern Conference championship during his tenure. “We thank Paul, Randy and Don for their service to our team,” said Rutherford, "Paul has made a big contribution to the building blocks of this franchise." The Hurricanes take to the ice Thursday at the RBC Center against the Pittsburgh Penguins at 7 p.m. Tickets are available via the RBC Center’s Dodge Box Office, by calling TicketMaster at 919-834-4000.